The term serverless gets thrown around a lot, but what does it really mean? What are the benefits & the drawbacks? 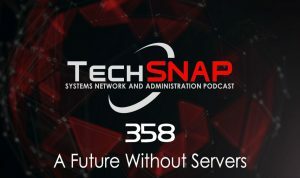 It’s a TechSNAP introduction to Serverless Architecture. Plus new research with ideas to dramatically improve private web browsing, the growing problem of tracking security vulnerabilities with CVE’s & much more! In V2 of Pwned Passwords, launched last week, Hunt updated his password data set from 320 million passwords to 501 million new passwords, pulled from almost 3,000 breaches over the past year. A record-breaking number of 20,832 vulnerabilities have been discovered in 2017 but only 12,932 of these received an official CVE identifier last year, a Risk Based Security (RBS) report reveals. What is Serverless Architecture? What are its criticisms and drawbacks? Serverless architectures refer to applications that significantly depend on third-party services (knows as Backend as a Service or “BaaS”) or on custom code that’s run in ephemeral containers (Function as a Service or “FaaS”), the best known vendor host of which currently is AWS Lambda. You don’t have to pay for idle capacity. There is no need to pre- or over-provision capacity for things like compute and storage. For example, there is no charge when your code is not running. Develop, test and deploy in a single environment, to any cloud provider. You don’t have to provision infrastructure or worry about scale. Serverless teams cut time to market in half. Maybe the ultimate layer of abstraction. The vendor, like Amazon, is patching/maintaining the server base for you. Removing the developer from the process. Traditional server management roles may start to transition to service management, configuration, and manage all the abstractions AWS gives you. IE the admins role goes from one wrangeling the operating system, to wrangling layers of abstraction and independent services. No local disk, you send data in, and data comes out. Not ideal for ongoing workloads. Alex has BIG cloud storage requirements….